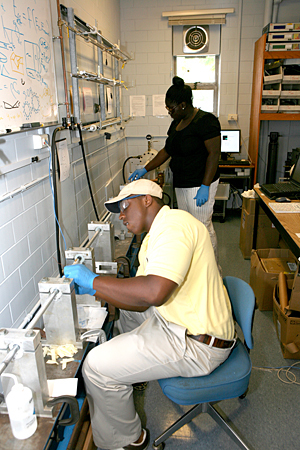 11:36 a.m., June 29, 2009----Early in June, almost 50 undergraduate students arrived at the University of Delaware's Center for Composite Materials (CCM), ready to spend the summer gaining valuable hands-on experience in the center's state-of-the-art composites fabrication, characterization, and testing facilities. According to Jack Gillespie, CCM director and Donald C. Phillips Professor of Civil and Environmental Engineering, the 2009 program involves a record-high number of participants. “We typically have 30 or 35 students, but the success CCM is enjoying in terms of research funding has enabled us to make offers to more students this year,” he says. The students represent not only UD but also Winona (Minn.) State and Tuskegee (Ala.) universities in the United States, as well as the Ecole Polytechnique in France. The popularity of CCM's undergraduate research program, which was established in 1981, is due in part to the multidisciplinary, real-world projects the center offers. “The work here complements what the students learn in the classroom and exposes them to ideas they won't see in textbooks,” says Gillespie, who has joint faculty appointments in the Department of Civil and Environmental Engineering and the Department of Materials Science and Engineering. In some cases, a summer research project at CCM grows into a senior thesis. Jeff Knopf, who earned an honors degree with distinction in chemical engineering in 2009, began working at CCM as a sophomore. Advised by Norman Wagner, the Alvin B. and Julia O. Stiles Professor of Chemical Engineering, Knopf completed a senior thesis focused on electrospinning, a fiber production technique that uses electric fields to generate continuous polymer nanofibers. Munetaka Kubota, a rising senior majoring in mechanical engineering, is now in his third summer at the center. Advised by Shridhar Yarlagadda, assistant director for research at CCM and associate professor in the Department of Electrical and Computer Engineering, Kubota is investigating cure of aerospace-grade adhesives. While Knopf and Kubota have spent a significant amount of time in CCM's research labs, most of the students here this summer are experiencing the center for the first time. 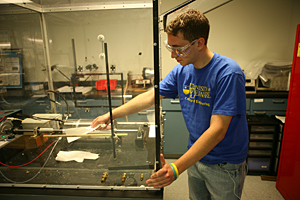 John Zerhusen, a rising senior in mechanical engineering at UD, learned about CCM through the Department of Mechanical Engineering. Another newcomer this year is Kyle Hoffman, a rising senior at Winona State University in Minnesota -- one of only a handful of schools in the U.S. that offer composite material engineering as an undergraduate major. Two of the other first-time summer interns are from Tuskegee University, a historically black university in Alabama. Tuskegee and UD have a long-term, multi-faceted research and education collaboration through CCM, organized around joint programs with the U.S. Army. Keosha Forrest and Emory Head, both rising seniors at Tuskegee, are working on CCM's shear-thickening fluid (STF) project for extremity protection. Co-advised by Wagner and Gillespie, the two are learning how to synthesize and evaluate the materials and will spend some time at ARL toward the end of summer studying the STF-fabric interaction.